I often wonder if my… umm. … multifocused approach to work (or, ‘all the things on my plate at a given moment’) is a feature of the profession, or a feature of me. Today is one of those days. The following is a list of things I am thinking about today, while booting up the computer (I know, it’s late. Yesterday was fine, but today Daylight Savings kicked me to the curb!). These are just the work things. Tell me – am I crazy? Or is my normal something like your normal too? My desk. It’s really really bad. There are things I should be thinking about that I’m holding off on until after break – a survey (almost ready to go to IRB, an article, the logistics of a shift I’m coordinating, launching our brand new graphic novels collection, and scaffolding information literacy objectives over one of my department’s scaffolded learning objectives. Two years. Nine years. It’s odd when my professional anniversaries line up. Today marks two years in my current position, in Reno, at UNR. Sometime in the past two weeks marked 9 years since I began my first out-of-the-nest post-MLS professional position. I think the two skills learned over the years that have helped me accomplish goals are patience (so much more to learn here!) and strategic thinking. I think it’s these two skillsets that established librarians wish fresh new librarians had? Or at least, I think it’s the absence of these two that I see when I feel myself growing a bun and clutching my pearls in the presence of new, amazing, exciting, energy. I think back to my first position – a one semester visiting position at a very small liberal arts college — with a little awe. I was full of curiosity and opinions and eagerness. I had spent two and a half years doing professional level work in libraries, and felt comfortable that with my perceived role as a librarian. I hadn’t realized all the politics and administration that I had been shielded from. It’s safe to say I was pretty naive. I was in truth absent any sense of history, or workplace politics. I have been in grad school for my entire adult life — and in grad school, hurt feelings or political treachery only have to be survived for the rest of the semester. After that, a new dynamic, every time. The realities of working with other people, for years and even decades, were opaque to me. I similarly lacked the vision to see more than 2 or 3 months away; all projects needed to be done now! I was hard-wired to semester-length time frames. It was unthinkable that most major projects might take that long to just line up the ducks! The first was that I worked with a staff that had primarily worked together for close to two decades or more — and who also lived in this very tiny town together, with kids in schools, opinions on local politics, and ancient histories amongst them. Understanding the detente that they all lived within was my biggest challenge there. When everything in your life is tied into everything else in one way or another, patience, civility and distance are the most important traits a person can bring to the table. Even more important then any other qualities of work effectiveness. Very hard for this gal from massive suburbia to take in — small town living taught me a lot about how people make allowances for each other. The second was having a colleague who regularly spoke with me about how the decisions she was making were part of long term strategies. I really owe any strategic planning skills I possess at the project and desire level to Jenica Rogers. She showed me the context I needed to grasp how things happened and changed in libraries. So I sit here now, nine years or 13 years in, I know have so much further to go, more to learn, more things I want to see happen. But I am also seeing groundwork come to fruition, I am seeing why planning backwards and implementing forwards works. And why history matters (you gotta know to change it or move around — or know who to avoid!). I am seeing seeds I planted 6 months in start to bear, and seeing things I wrote off but dropped thoughts about start to seem possible. I hope I get to report successes on this front when I ponder 3 years here. Categories: Uncategorized | Tags: professional position, strategic thinking | Permalink. 11 issues facing academic libraries right now. A friend asked me if I had any thoughts on the top issues facing academic libraries right now, for a class she’s teaching for first year LIS students. It turns out — no surprise — I do have thoughts about that! I sat down and built a list off the top of my head. With some fleshed out explanation, here’s my list. I tried to think ‘whole library’. I did not include on this list “The impact of the new ACRL Information Literacy standards/ integration of threshold concepts”. I know that will have a huge impact, but only on a specific sector of academic librarianship, and I felt the teaching pressures were already represented. Context: I am an instruction and outreach librarian, with liaison responsibilities in the social sciences. I am tech & geek friendly, but probably wouldn’t be called techy or geeky. I’ve never worked anywhere but public services. I’ve been in academic libraries for over 10 years, and have worked (always in a tenure track position) in four academic libraries. Also, I bet this a really idiosyncratic list. So I really want to know: What’s on your list? What are the big challenges you see coming at academic libraries? Please share! MOOCs and the rise of online education. In particular, there are a swarm of licensing issues in relation to MOOCs, and issues related to preparedness of librarians to be effective with online pedagogy in relation to online education. Some universities have staffed effectively for embedding librarians in course-integrated online ed, but I don’t think that’s the norm. Also, Online Ed tends to be designed to accommodate students who work, so bankers hours aren’t useful for online students; librarians tend not to be available when students enrolled in online degree courses do their work, so how to accommodate that? This is both a philosophical as well as a logistical question. Class size/ budget cuts on universities leading to very high faculty::student ratios. This translates directly to fewer research assignments, which raises questions of the necessity for better liaison skills, more confidence organizationally and individually in being willing and able to talk effectively to profs about creating information literate assignments that maximize professorial time. In short — if students don’t do research papers, who needs to spend money on research librarians? How do we tell our stories/make our cases for the importance of UG programs which integrate these skills? We have not as a profession moved the professorate or ourselves away from the ineffective one-shot info lit session. Lots of ramifications and opportunities — how to do curriculum mapping and info lit scaffolding (politically, personally, professionally — hordes of skills not necessarily addressed in LIS programs)? Relationship building with faculty, lots of liaison skills needed here. Which LIS programs do not teach (if you were taught how to be a liaison on library school, please let me know. I want to know!) . This item, like others, ties in to #10: Leadership Issues. Given for how long this has been a known issue and concern, and with so much data to back it up, I question the structure, nature, training, abilities etc. of library leadership in individual libraries, as well as the organizations that lead us. How have libraries utterly failed to position themselves, universally, as educators with greater things to offer than the one shot?? This is leadership, because this is funding, and advocacy, and institutional influence. Addressing this issue would change the shape of university libraries– imagine what a library would look like if it was staffed adequately to teach credit classes in every major, as well as introductory library research classes. Big Deal comes home to roost. Money is tight. We’ve invested in too many journal packages/aggregator access to back away, we allow the vendors to select our materials and the cost, and we’ve invested enormous staff time and org money into Discovery services which allow use to find the content we’ve bought in journal packages. We are no longer even in a position to cut to save money anymore, we can only amputate. Not a good situation. “Vendors set too many terms and we don’t have the skills to combat them” is perhaps a better umbrella for this one. The rise of data-based Social Sciences & Humanities-based research. Libraries are completely unprepared for supporting this. We don’t even have the language to talk about it, and lack a framework for understanding what our role is in supporting data-oriented social scientists and their students. This is cresting (will crest? I suspect it will break unmistakably on my campus by Fall 2015) at a time when the Sciences are more privileged than ever and social sciences underfunded because they don’t shake the grant trees. The consumption and analysis of social sciences research data raises issues of IRs; of statistical literacy in library staff; of funding the purchasing (or not) whole new categories of things in these very tight times; of access issues and our philosophical commitment to them, since data sets and data set collections are not shareable. Big data, digital humanities, are we anywhere near able to support these areas as librarians/libraries? Ebooks. I see huge issues wrapped up in ebooks: we are at the mercy of largely and fundamentally non-negotiable licenses; how do we address patron privacy when ebook downloads and access log ins involve any number of vendors and we aren’t actually in license with all but the ebook vendor? There are huge issues across the digital divide: when ebooks can;t be downloaded, users need to have both internet access and appropriate devices in order to read them. (remember when you were in college and split the landline with the roommates, and there was no $100 internet bill? These are significant expenses for college students). In addition, ebooks introduce huge and ignored implications for library’s abilities to share collections with each other — licenses won’t allow for it. Additionally, we know, pedagogically, students don’t read ebooks. They search and snag — so what are the implications for development of long term sustained thinking? Perhaps not a library issue, but ours insofar as we do shape life in the academy to some degree in this area. Patron privacy. We give it away left and right (this comes back to vendor control, but not solely). Do we even read the licenses for privacy? Are we at all prepared to understand the privacy implications of an app-based world? When every app on the device has access to everything a user does on their mobile device, are we able to protect patron privacy any more? Beyond the (in)ability to code it into place, we as an aggregate of people lack the awareness of who is in our digital foodchains, and thus who might have in-the-moment access to patron library-search data. I won’t even address the issues around interest in that chain. Reliance upon ineffectual and/or over-priced vendor products that approximate our needs but never fill them. This challenge is significantly amplified when paired with lack of web applications developers on library staffs. We spend a lot of money on poor products, and we can’t afford the folks who could improve the user experience, all around. Libraries cannot afford the high cost of code monkeys in the modern market, but they are essential — and would ideally also have a library -borne understanding of the work. Libraries need strong leadership, and need to develop it across the whole bench, from the newest librarians onward. Instead we still see folks promoted to management for being good librarians, without necessarily being good administrators, managers, or leaders. Harvard Leadership Institute can’t do it all, it must be internalized. Change aversion/change management. I call any library group of more than 5 folks who have worked together for over 15 years “a wall”. Often excellent and innovative colleagues individually, put in a room together, they magically become an impenetrable object of “why we do things this way”. Young librarians and new librarians (2 often distinct groups) are seen as not having paid their dues until they lose their shiny new eyes and toe the company line — even though they are almost always hired to bring new ideas in. Libraries need the energy, the perspective, and the forward motion. LIS programs aren’t teaching “how to influence entrenched colleagues” and new librarians break under the disillusionment and pain. And Management isn’t prepared/trained/able to punch through those walls. I did not include issues surrounding tenure on this list. I feel strongly that public services librarians are educators and should be tenure stream faculty members. I feel they should also be tenure stream faculty members– with all the teaching and research and service obligations and support, just as the rest of campus will recognize and respect. Being faculty on a campus where no other faculty knows or groks that librarians are faculty isn’t doing it right. That said, I’ve noted that on small campuses librarians are able to do much of the important educative work without being faculty. It seems to be a big campus issue? Please — what’s on your list? What did you think was missing? A few months ago (time sure gets funny around the end of Fall semester, with all those holidays!) I started drafting a social media policy for MPOW. We’ve never had one, but some questions arose around best practices for starting YouTube channels, and I was asked to draft some. The week I was starting to dig into drafting this, a query went out over the ILI-L email list asking about social media policies, and I mentioned I was starting to write one. The response was overwhelming — I had over 100 personal requests for a copy of the policy once it was written. And if anyone else mentioned their library’s policy over that list, I missed it. Given that demand, I decided to share my draft policy — and the thought processes that went into it — broadly. There are few Library social media policies publicly available, and the peculiarities of each institution drives the shape of any policy of this type. So, here are the things I considered when drafting my best practices. My university has no social media policies. Therefore, I don’t have to match theirs in tone or content, or ensure that the Library policies follow any thing other than the law. Social media is a tiny part of my job, and it was a tiny part of the job of the person who managed it before me. I inherited Knowledge Center accounts on Twitter, Facebook, WordPress, Pinterest, and Flickr. I have begun posting on Facebook, have a mess to sort out on Flickr, do not have time to keep Twitter active, and Pinterest is a playground for us. I have also created sites for us on Instagram and YouTube. I manage the Knowledge Center accounts, and only those accounts. Special Collections, the Basque Library, the Engineering Library, Digital Media, and a handful of other units in the Libraries have their own accounts on many of these same sites, and more. This document comes after we started using social media and not before. Every institution has history. Mine is no exception. There was a kerfuffle a couple of years ago about a posting by an individual on one of their own social media accounts. There were some bruised feelings, and some suspicion about motives. Not large, but still lingering and I thought it was important to not antagonize those feelings. We don’t have many policies. We have an increasingly transient librarian population. And I spent the better part of a year at a previous job working with Yahoo to reclaim Flickr login credentials set up by a graduate student but never shared. I’m looking forward to hearing your thoughts. I already suspect I will be creating sub-documents/tipsheets for each media platform. Requiring social media content engagement? So far, the conference has been interesting, if not very applicable to running a unit’s social media on a campus with no centralized social media body. One takeaway so far has me excited: requiring team members to contribute, and adding that expectation to annual reports, expectations, and goals. The impetus behind this (for both me and the presenter) is the challenge of trying to pull content out of the folks who are producing it in other formats all the time. At the same time, I would use this to engage a conversation across the library about the value we put on social media, and the desired level engagement of the library as a whole in the project. I’m a little excited. And very skeptical. And curious about your experiences with things like this with your social media services? This semester is looking to be a doozy. I’ve taken on a few programs that happen in the next couple of weeks, launched a student advisory committee, and taken on social media for the Knowledge Center. All in addition to my liaison and instruction duties to my (growing) departments and a severe need to get my research agenda kicked into high gear (there’s a data survey that needs to be finalized and IRB’ed, and an article about outreach that needs to get out of my head and onto paper, and submitted somewhere before Dec. 31). In addition, I go to ICPSR bootcamp in a few weeks, and have two programs at Internet Librarian to prepare (end of October). Yesterday was a whirlwind of 5 hours of back-to-back-to-back meetings and workshops and insane reference desk hours. Today has been, so far, about keeping a thousand tiny balls in the air. Proof sheets ready to sign off on for Burning Inquiry lecture and exhibit. Head into secure stacks in Special Collections (3rd floor) to measure and count mats and frames for the artist whose work I’ll be displaying in Burning Inquiry. Answer: way too many sizes, way too few of each if you want mats…. Ponder the issue of non-traditional students and the effect of computer illiteracy on my teaching style (this came up int he two classes I’ve taught this week). This will be in the back of my head for a while, until I can resolve how to address it. 11:40 – email is all caught up and responded to. Display images are signed off on for announcing NVivo, and for Constitution Day. Determine if I really am not doing anything techy enough to say yes to invitation to do a tech talk radio call-in show? Head to Trader Joe’s for some staples and a kale salad for dinner. And mango gummy drops. So, that’s today! I’m going to warm up lunch and play with Mendeley before my workshop. What’s your day like today? Iris Jastram posted something a few days ago about her approach to summer projects, and I am filled with envy. I’ve posted my list of big summer projects on my wall in big letters. Each day, I have to touch at least two of them, no matter how minor the touch. There will be other things that crop up (there always are) so this leaves me plenty of wiggle room, but at least I’ll be making progress for sure. 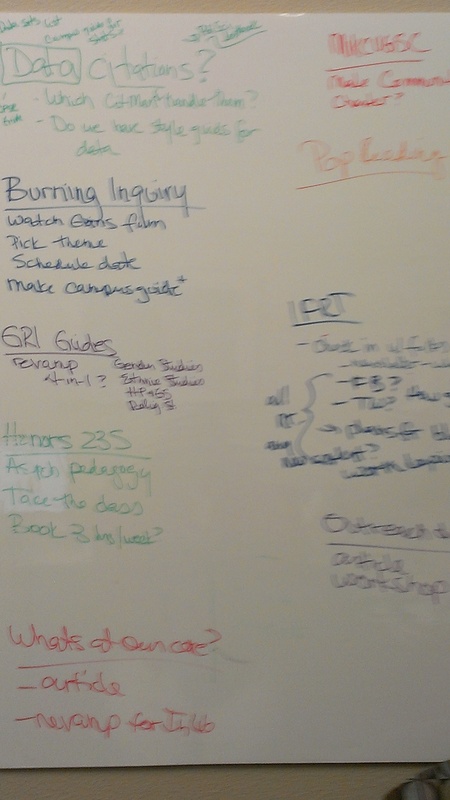 At the start of summer (mine started in May…) I took some time to clear off the whiteboard from the year’s projects and put each of my 3 big projects on it, plus one spillover from the semester. And added an article I wanted to write. And another I ought to write. And then — with my projects ballooned from 3 to 10 — I learned that summer life here includes an awful lot of priorities, often other folk’s, unexpected, and on short deadline. Assessment planning. An excruciating approach (due to specific circumstances) to cancellations (lengthy lists requiring attention drop into my mailbox unexpectedly and want immediate attention…). Candidates on campus. We’re extraordinarily short staffed this summer, so covering reference desk shifts for folk’s vacations becomes a time sink. Orientation happens 17 times over summer, and covering tours with the smaller staff is more of a commitment than last year. We have active summer classes, so unanticipated instruction requests arrive from time to time. And three weeks ago, the library’s social media organs were given in to my care (I wanted them. I asked for them in March. I’m glad to have them. They just weren’t part of the plan). I come to work every day. I work all day, long days. And I have barely touched my original Big Summer Projects list. My original goals and hopes for the summer. We are halfway through summer, and my articles are in no better shape than they were in April. My ALA obligations are being taken care of (including post-ALA work). But I would sing praise to the universe if I could have a summer that allowed me to work on my projects and make good progress on them. I don’t even know what I would do in gratitude if the summer was such that I could do that and make good use of the copious vacation time and furlough I’m accruing and can’t get ahead of. Next summer, I may set no priorities. But that’s not OK with me. I have big projects that need big time to get worked on! How do you all handle these conflicting demands for your time in the summer months? Have you given up? Or developed a strategy that works? I’m in need of advice for managing this! 10 years, three libraries, and I fail at this every summer!